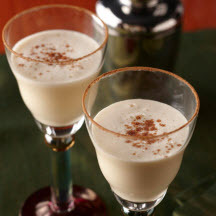 For an eggnog guests won't soon forget, try this spirited cocktail topped with a dusting of pumpkin pie spice! Place cream, milk, brandy, simple syrup, egg, vanilla and ice in cocktail shaker. Shake well until blended. Pour into two glasses rimmed with pumpkin pie spice, if desired. Dust with additional pumpkin pie spice. *Because they're pasteurized in a warm water bath, they're safe for all no-bake and no-cook recipes. Nutritional Information Per Serving (1/2 of recipe): Calories 250; Calories from; Total Fat 14g; Saturated Fat 8g; Trans Fat 0g; Cholesterol 135mg; Sodium 55mg; Total Carbohydrate 14g; Dietary Fiber 0g; Sugars 13g; Protein 4g; Vitamin A 10%; Vitamin C 0%; Calcium 6%; Iron 2%. Recipe and photograph provided by Davidson's Safest Choice via Brandpoint Content; Copyright 1996-2014.